Laura Price is an Oxfordshire County Councillor for Whitney South and Central Division. Labour has had some notable successes in David Cameron’s former seat in recent years. 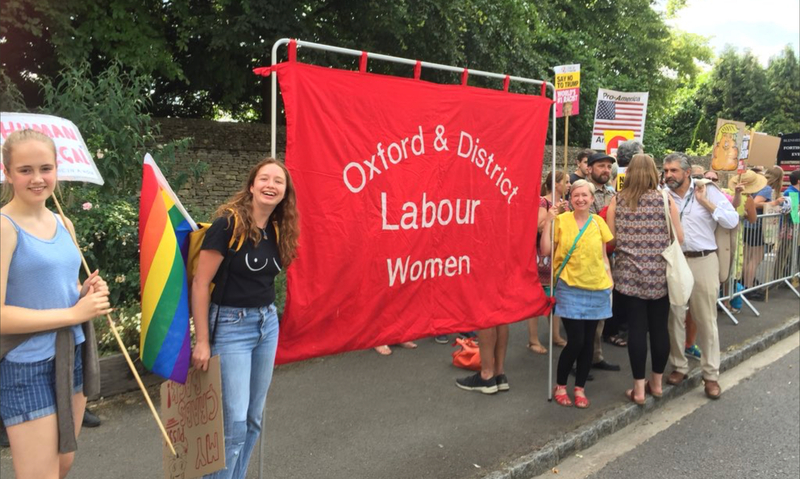 Laura is pictured above (holding the right of the banner) at the recent reception committee for the scary orange white supremacist creature at Blenheim Palace. On Monday morning Witney and West Oxfordshire woke to the news that MP Robert Courts had resigned from his role at the Foreign Office in order to back Boris and his vision for a hard Brexit. Any political enjoyment of the chaos within the Conservative Party was fleeting when balanced against my deep concern at our representative in Parliament ignoring the fact that his constituency voted by a clear margin to Remain. Perceived future career prospects have clearly trumped a responsibility to protect residents from the damage that a Boris Brexit would bring. A network of rural villages and market towns, West Oxfordshire residents work in and rely on a diverse range of industries, from F1 to publishing, with most of the major players having the current benefits of EU membership woven into their success. We're also lucky to have a rich history of skilled engineering, with employers such as Siemens Magnet Technology providing hundreds of jobs locally, as part of a production pathway for MRI scanners which flows across European countries. For me however, one of the most significant threats is our ability to sustain the public sector. As an area of high employment, with an ageing population, recruitment is cited as being as big a challenge as funding in enabling our hospitals and care providers to meet ever increasing demand. Uncertainty over our relationship isn't only leading EU nurses, doctors and care workers to re-think their future here, but it is also jeopardising the ability of the NHS and the County Council to deliver a workable forward plan. Politicians like Courts might be comfortable with pretending that the response to the referendum result is as simple as repeating "the will of the people", but for our communities it will be the detail that matters - although today it sadly feels like the interests of his constituents couldn't be further from his mind.